'''SHIFT 2 Unleashed''', also known as '''Need For Speed: SHIFT 2 Unleashed''' is the 17th instalment in the long-running [[Need for Speed|Need For Speed]] series of racing games, developed by Slightly Mad Studios and published by [[Electronic Arts]]. It is the direct sequel to 2009's [[Need for Speed SHIFT|Need For Speed: SHIFT]] and expands on the gameplay and features of the original. Some of the new features include night-time racing, a new helmet camera and the Autolog, which was first introduced in [[Need for Speed Hot Pursuit 2010]]. A new elite handling model aimed at sim-racing enthusiasts is also available, while the physics engine and overall handling of the cars was improved, especially for racing wheels. In addition to this, SHIFT 2 Unleashed will also feature some of the cars and tracks of the 2010 FIA GT1 World Championship and 2010 FIA GT3 European Championship, among other racing content. The final game features 151 cars and 44 different tracks (DLC included). 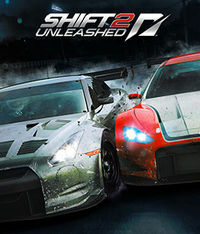 '''SHIFT 2: Unleashed''', also known as '''Need For Speed: SHIFT 2 Unleashed''', is the 17<small>th</small> instalment in the long-running [[Need for Speed|Need For Speed]] series of racing games, developed by Slightly Mad Studios and published by Electronic Arts. It is the direct sequel to 2009's [[Need for Speed SHIFT|Need For Speed: SHIFT]] and expands on the gameplay and features of the original. 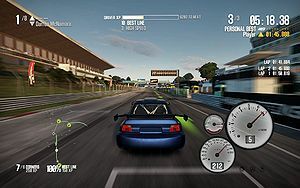 The game shipped in two editions, the normal one and a '''Limited Edition''', which comes with three additional cars: the Alfa Romeo Guilietta QV, Lamborghini Murciélago LP640 and Nissan Silvia spec.R Aero (S15). It also comes with 40 additional events, which include Old vs. New matchups, Manufacturer Battles and Single Manufacturer races. Some of the new features include night-time racing, a new helmet camera and Autolog, which was first introduced in [[Need for Speed Hot Pursuit 2010|Need For Speed: Hot Pursuit]]. A new elite handling model aimed at sim-racing enthusiasts is also available, while the physics engine and overall handling of the cars was improved to make it closer to PC racing simulators. There was also improvements made to the controls so the use of a racing wheel is recommended. In addition to this, SHIFT 2 Unleashed also features some of the cars and tracks of the 2010 FIA GT1 World Championship and the 2010 FIA GT3 European Championship, among other racing content. The final game features 125 cars and 36 different tracks. Two DLC packs (downloadable content) added more cars and tracks, for a grand total of 151 cars and 44 tracks. The game shipped in two editions, the normal one and a '''Limited Edition''', which comes with 40 additional events (Old vs. New matchups, Manufacturer Battles and Single Manufacturer races), and three additional cars: the Alfa Romeo Guilietta QV, the Lamborghini Murciélago LP 640 and the Nissan Silvia spec.R Aero (S15). This page was last modified on 25 October 2012, at 06:23. This page has been accessed 222,233 times.